Warde when we first met her. “We named her Warde because she is still very young, and she’ll flower soon,” her mother tells us. The name Warde in Arabic means ‘rose’ or ‘flower’. The young girl, who is just seven months old, was born with clubfoot on both feet. Warde’s mother, Hind, came to Lebanon as a refugee in 2013. She left the city that she had lived in her whole life after her father was killed in an airstrike. She doesn’t talk much about the loss of her father, and quickly moves on to talk about something happier. “I met my husband in Lebanon,” she says. “We met through a friend of his. We really liked each other from the start.” They married soon after, and began trying to have children. But after two years of trying, she still didn’t fall pregnant. She went to see a doctor, who recommended that she start IVF. They used all of their savings to pay for it, and thankfully it paid off. A few months into the pregnancy, doctors informed her that she would be having twins. She was absolutely ecstatic! She couldn’t wait to meet her babies. “I was shocked,” Hind tells us when she describes the day that Warde and her twin brother were born. 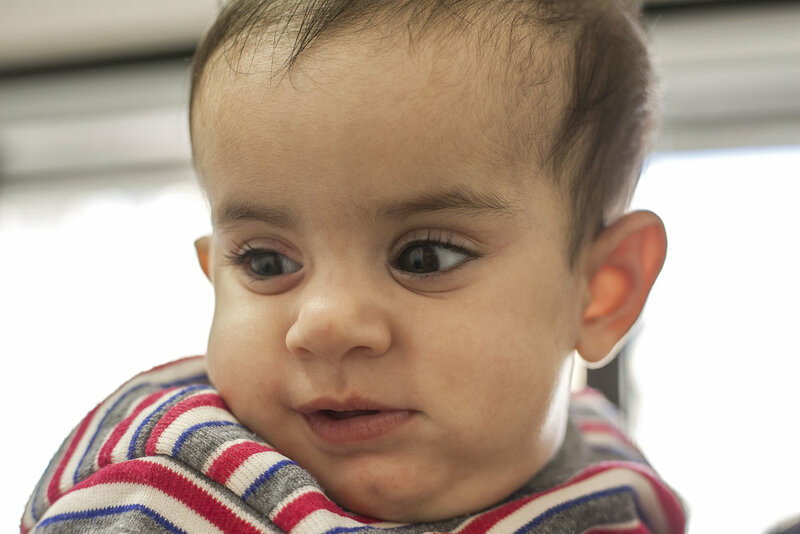 Warde was the first to enter this world, but doctors instantly rushed her away. She was so worried about Warde that she feared to look at her son, in case he had problems as well. It was only after the family had spent all of their money on these casting sessions that they were told that Warde would need to see a pediatric orthopedic doctor, and not a general orthopedic doctor. The expensive treatment was unsuccessful – and their daughter was still in need of medical help. Furious with the doctor who had taken all their money, the family then went to see the Lebanese Red Cross to see if they might be able to help. There they were told about INARA’s new orthopedic project, and were given our number. We brought Warde in to meet Dr Taha at the American University of Beirut Medical Center (AUBMC). She had serial casting sessions over the next two months. After that she had surgery (an Achilles tenotomy) in December 2017. She was then fitted with a brace that she will have to wear until she is two years of age. Following this, her clubfoot should be fully fixed and Warde will be able to live a happy and healthy life again. Our support comes as a huge relief to Warde’s family. After spending all their money on failed treatment, they had given up hope of ever fixing Warde’s deformity. Warde's treatment was funded by UNICEF.